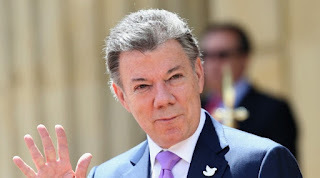 Juan Manuel Santos will leave the Colombian presidency in August after two terms focused on reaching a peace agreement with the Revolutionary Armed Forces of Colombia People's Army (FARC, for its Spanish acronym). That process earned him the Nobel Peace Prize but opened a stage of intense social polarization. The guerrillas demobilized, gave up their weapons and became a political force, a transition to civil life, filled with obstacles. After leading a coalition government for eight years, the power will pass to the winner of the May 27 elections. The polls point as a favorite Ivan Duque, the candidate of former president Álvaro Uribe, and perhaps, the main detractor of the agreements. However, the current president, recently gave an interview to EL PAÍS at the Casa de Nariño before traveling to Spain, in which he warns that peace is irreversible, and no one can turn it back. When asked why the Colombian society is divided today, Santos said: “I did what President Lincoln did in the United States. I called my rivals in the campaign to be part of the Government and we created national unity with the most representative parties. We have managed to extract as many constitutional reforms and laws from history in this country. That unit is dissolved with the next elections because there will be another president. There is also a polarization, unfortunate, not sought by the Government, that was generated around the peace process, but that is also a product of what is happening in the whole world. I hope that the country can have common denominators that allow us to unite around certain causes”. The Colombian leader remarked that the implementation of peace is going well, and that it took 15 years to implement the process. “We have 80 short-term objectives that had to be met in the first two years. In one year and four months, we already have 75%. I hope that in the rest of the year the other 25% will be finished”, said Santos.